The Prince George’s County Youth CareerConnect program (PGC-YCCP) is a 4 year STEM education initiative funded by the U.S Department of Labor to provide over 2,500 high school students in Prince George’s County with education and skills training, internships, college prep and dual enrollment, mentoring, and job readiness training to excel in the high growth industries in Healthcare and Information Technology(IT). Led by Employ Prince George’s, Inc., PGC-YCCP is a collaboration among the Prince George’s County Public Schools, Prince George’s County Community College, The Maryland Center at Bowie State University, Hillside Work Scholarship Connection, the Latin American Youth Center, and two business partners, Lockheed Martin and Dimensions Healthcare Systems. 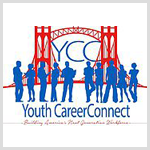 Questions about our program, please email us at YCC@co.pg.md.us. “Denise and I attended the County Executive’s Annual Luncheon last week at Newton White Mansion in Bowie. 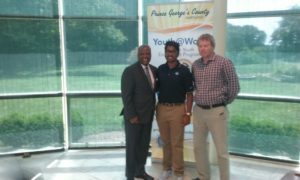 Charles G. was being recognized as one of the Exceptional Employees who was funded by SYEP this summer. Charles graduated this spring with a 3.96 grade point average, and after a fall semester at Prince George’s County Community College will be attending the University of Maryland –College Park. Beyond a great grade point average, Charles is leaving Fairmont Heights High School with four industry recognized IT certifications, a Certificate of Special Recognition from Congresswoman Donna Edwards, and multiple science fair awards.